The evolution of Cable Beach has all eyes on it as what was once called The Bahamian Riviera transforms itself and regains its former allure. The multi-billion-dollar BahaMar project is being built to outshine neighboring mega-resort Atlantis on nearby Paradise Island. The new five-star project will feature several luxury hotels, ownership opportunities, Rodeo Drive shopping, a professional golf course, and the largest casino in the Caribbean. 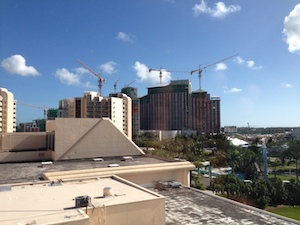 BahaMar is not slated for completion until late 2014; however, the Melia Nassau Beach hotel is open for business. 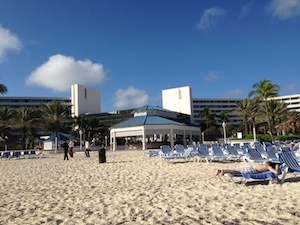 The Sheraton hotel was purchased by BahaMar and shortly thereafter they opted to do business with Melia, a Spanish company known worldwide for superior quality and service. The decades-old hotel was rebranded but so far little has changed. Melia brought back the popular all-inclusive option at Melia Nassau Beach, the first Melia hotel in the English-speaking Caribbean. I visited the hotel in late January 2014 and found the hotel to be fairly similar to what I remembered during the Sheraton and even the Radisson days prior to that. (I’ve been visiting the hotel for twenty years.) The Radisson was nice, but when the Sheraton took over many improvements were made. Since taking over, Melia has added their trademark new age-techno-world beat music playing in the background and there are now hundreds of candles scattered throughout the hotel. They’ve changed the ambience a little but won’t begin their major renovations until later in the year. The plan is to share BahaMar’s grand opening and celebrate their new look and new name: Melia at BahaMar. As far as Caribbean resorts go, Melia does it right. At Melia Paradissus in The Dominican Republic, I was greeted by our personal concierge, who gave us a tour of the resort and handed me a cell phone to reach him 24 hours a day. On the long flight from California, I had picked up a little “airline flu” and was not feeling too well. I called the concierge, who said he knew what I needed, went to a local pharmacy, and delivered medicine to our room. I took one pill and the symptoms vanished. While he was in the room, he made sure our refrigerator was stocked with the beverages we told them we liked. It was. As the kitchen was delivering some fresh fruit and a welcome basket with champagne, snorkel gear, and sunscreen, our concierge was asking my son which gaming system he liked and what type of games he played. Later, the concierge installed a PlayStation and delivered half a dozen games. As he left, refusing to take a tip, he reminded me that 24-hour room service was part of our all-inclusive package. Melia Nassau Beach has a lot of catching up to do if it’s to be anything like Paradissus. I opted for the all-inclusive plan to test its value. I’m a numbers guy so I did a little math to figure out just how much this trip was costing me. I used bookit.com to plan my trip and spent $1,643.43 in total. That included five nights in the hotel, roundtrip airfare from San Francisco, CA, and the all-inclusive plan. That breaks down to $328.68 per night. Airfare on American Airlines costs about $650 roundtrip, so that reduces the hotel cost to about $198.68 per night. Now keep in mind, resort prices in the Caribbean are not cheap anywhere. Here is how my costs break down: the breakfast buffet was $25, lunch was about $30, and dinner was another $50. If I had a half dozen of the local brew (Kalik or Sands) at $8.05 apiece (15% gratuity is included on everything, and don’t wrinkle your nose when I say six drinks in a day — most people here drink that in a sitting) then I’d spend about $153 on food and drinks. So my hotel room only cost me $45.68 per night. I was beginning to like the all-inclusive plan. Right now, the Melia Nassau Beach hotel is good VFM (value for money). Time will tell if the property improvements and added restaurants that have been promised for later this year will bring higher costs or if the hotel will simply become more popular. I was there for Super Bowl weekend and the hotel was only about 10-15 percent full. The weather was perfect, with low humidity, and the thermometer stayed in the mid-80s. This time of year is considered the high season so I wondered where all the snowbirds were. However, it was nice having most of the beach to myself and not having to wait for a table at the restaurants. I imagine that once Melia remodels and fires up their massive marketing machine this will all change.